I designed a new logo for our company, and ran into some issues with colour rendition, as I supplied the colours to our local newspapers for print. Designer is only accurate for CMYK rendition, and no other codes are even close! 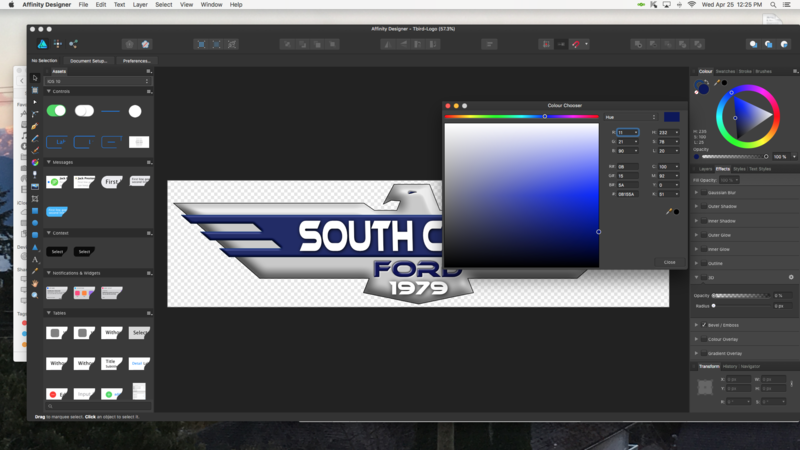 You can see from the screenshot the colour codes for this blue. Note that the HSL doesn't match from the colour wheel open, to that of the wheel above and to the right. Here are 3 websites that all agree almost exactly with HEX, CMYK, RGB and HSL; again note that the CMYK code in Designer is correct! I have made all of the necessary adjustments for my printing and display purposes, so I post this to help make good software better! The graphic designer that I sent the file to was using the CMYK, and the code I had found for one of the Ford blues suggested a decimal, and I didn't figure out to convert it to a percent, so I used RGB; our colours were way off. Exporting for any print format is important to be consistent. I certainly question the rendering from my iMac and printing of my Oki laser, as I didn't have near the turquoise of the printed copy given to me by the newspaper, but she used a different setting as mentioned.